Things are quickly heating up for what should prove to be an interesting February in the desktop video card market. AMD has already been up to bat once this week with the launch of the Radeon R7 250X, pushing AMD’s Cape Verde GPU back into the picture as the new anchor of their $99 price point. Now just 3 days later AMD is coming up to bat again, this time with the Radeon R7 265. The launch of the 250X earlier this week and now the 265 are part of a larger refactoring of AMD’s mainstream desktop product family. AMD is cutting prices and launching new products both to maintain and enhance their competitive position, and to fill holes in their lineup – however small – to cover as many price points as possible. The end result is that along with a price cut for the existing R7 260X, which will see AMD’s flagship Bonaire part drop to $119, AMD is also using this time to launch parts above it and below it in order to fill the holes this refactoring is creating. A key part of that refactoring strategy will be today’s launch of the Radeon R7 265. With R7 260X dropping to $119 and R9 270 holding at $179 (MSRP), AMD has a $60 gap that needs to be filled with a new product, and R7 265 is that product. Based on AMD’s venerable Pitcairn GPU, R7 265 will be filling this gap by bringing a variant of the Radeon HD 7850 back to the market, creating a 3rd tier Pitcairn product for the 200 series. Compared to the 7850 that it’s based on, R7 265 is receiving the same GPU clockspeed and memory clockspeed bump that the 7870-derrived R9 270 series saw last year that will make the R7 265 a bit faster than the 7850 it functionally replaces and making it better suited to fill the gap between the R9 270 and R7 260X. Meanwhile we also have on hand AMD’s Radeon R7 260 (vanilla). First announced back in mid-December and finally reaching shelves towards late January, R7 260 is AMD’s 2nd tier Bonaire part, creating a lower cost, lower performance variant of the R7 260X. Given the close timing of these launches, and since we’re already looking at one 260 series part today in the 265, we’ll also be taking a look at the 260 so that we can take a complete inventory of AMD’s $100-$150 lineup. Core Clock 900MHz 900MHz ? ? Starting off with the R7 265, from a specification standpoint the 265 is a rather straightforward specification bump of the 7850, or an equally straightforward harvesting of the R9 270 depending on your point of view. Taken from the latter point of view, 265 is nearly identical to 270, dropping 4 CUs and leaving 265 at 16 CUs (1024 SPs) but otherwise leaving it unchanged. This means all 32 ROPs are intact, along with the full 256-bit memory bus. Clockspeeds on the other hand are identical to the 270. 265 gets the same 900MHz base clock and 925MHz boost clock, and meanwhile the memory clock for the card’s 2GB of GDDR5 stands at 5.6GHz. This means that the entirety of the performance differences between the 265 and 270 will come down to the 4 CU gap between the two cards, giving 265 80% of the theoretical shader/texturing performance of 270, 100% of the ROP throughput, and 100% of the memory bandwidth. As a result the performance difference between the cards will depend on whether any given test is shader/texture bound – which is most games these days – or ROP/memory bound. Meanwhile 265’s official “typical board power” stands at 150W, the same as the 270. 3rd tier parts rarely see a reduction in power consumption, so this is not unexpected. Though in practice power consumption should be at least marginally lower than 270’s. Based on specs alone the 265 should be a strong competitor, but the one downside to its introduction will be the disruption of AMD’s 200 series namespace. AMD backed themselves into a corner by starting with 270 (vanilla) for their 270 series products, and as a result they didn’t leave themselves any space to name a lower tier Pitcairn product, short of using even more absurd suffixes (such as the return of LE). As a result AMD has made the next best move by naming it 265, which is clearly below 270, but complicates any discussion about the Radeon R7 260 series as a whole. 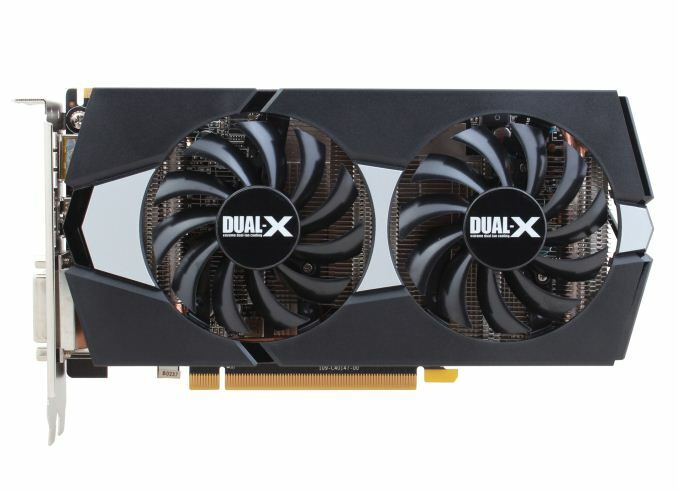 Due to 265 being Pitcairn based – a GCN 1.0 GPU – this means the 265 lacks functionality such as TrueAudio and XDMA that are found on the Bonaire (GCN 1.1) based R7 260X and R7 260. Consequently it’s no longer safe to say that all 260 series cards support those features; we’ll now have to specifically name Bonaire cards to avoid confusion. 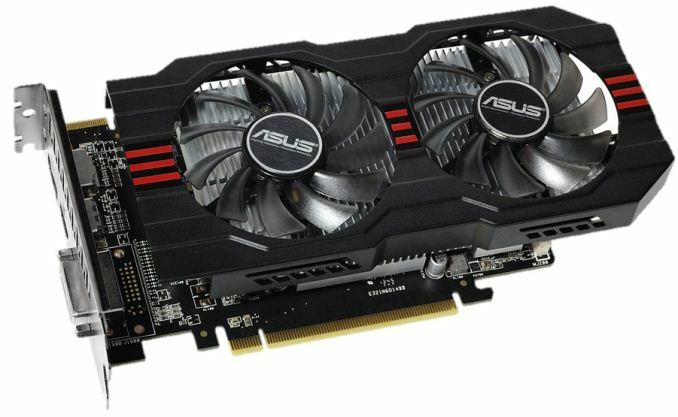 Moving on to our other card for the day, at the other end of the spectrum we have the R7 260. 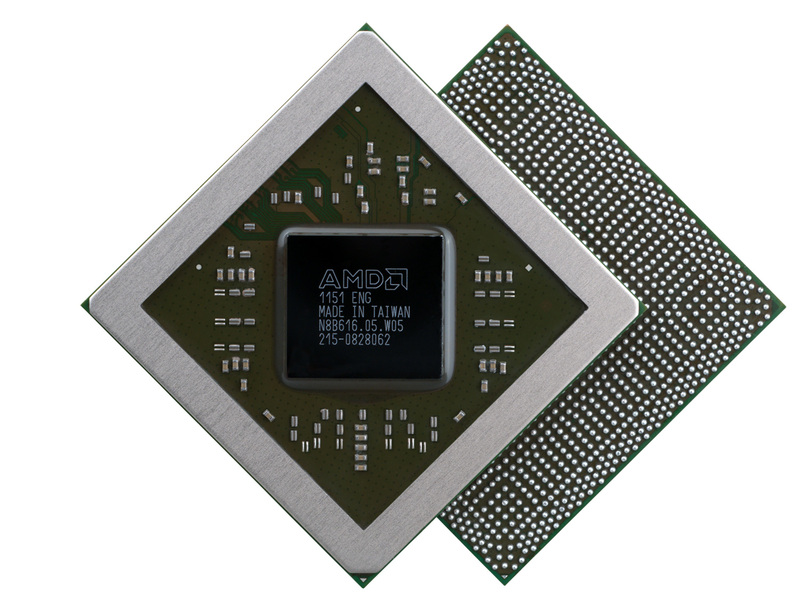 For 260 AMD has cut off 2 CUs, bringing the CU count down to 12 (768 SPs) and the texture unit count down to 48. The ROPs and the memory bus on the other hand remain unchanged at 16 ROPs and a 128-bit memory bus respectively. Meanwhile clockspeeds have also been reined in slightly versus 260X in order to allow some binning and to create a bit more of a divergence between the 260 and 260X. 260 tops out at 1GHz for the GPU clock and 6GHz for the memory clock, down from 1.1GHz and 6.5GHz respectively for the 260X. Combined with the reduced CU count from earlier, this puts theoretical performance for 260 at around 80% of 260X in shader/texture bound scenarios, and 92% in ROP or memory bound scenarios. On a side note, unlike all of AMD’s other GCN based products, Bonaire continues to flummox us as far as GPU clockspeeds are concerned. AMD continues to not publish their base GPU clockspeeds, opting only to publish the boost clockspeeds. But unlike Hawaii and other GCN 1.1 based cards, Bonaire based cards have no discernable base clockspeed – we’ve been unable to find a point where these products bottom-out at – so the true base clockspeeds of 260 and 260X are unknown to us. In this case the concept of a base clockspeed and a boost clockspeed are extremely muddled; the 260 either doesn’t drop low enough to hit its base clockspeed, or quite possibly doesn’t have one at all. The end result is that 260 runs as fast as it can under all loads (which is almost always 1GHz) with no minimum guarantee. In any case, going hand-in-hand with lower performance and lower clockspeeds will be lower power consumption. AMD’s official specifications for typical board power for the 260 is 95W, down from 115W on 260X. This means 260 will still require 1 PCIe power connector – Bonaire’s simply too big for sub-75W operation in a desktop SKU – but it will still be felt in very low power builds where every watt matters. Moving on to pricing and positioning, as we mentioned before today’s launch of the 265 and the recent launch of the 260 are part of a larger refactoring of AMD’s mainstream product lineup. AMD’s 250 lineup will be concentrated at sub-$100, the 270 lineup at $180+, and the 260 lineup will be at $100-$150. Specifically we’ll be looking at the 265 at $149, the price adjusted 260X at $119, and the 260 at $109, occupying a very narrow gap between the $99 250X and $119 260X. AMD’s only previous cards in this space were last-generation 7770 series cards and the 260X at $139, so this represents a significant increase in the density of AMD’s product stack in this price range. Unfortunately, both actual pricing and availability are likely to end up being a bit of a mess, and that goes for both products. To our chagrin, 265 is going to be another soft launch; AMD is not expecting cards to hit the shelves until the end of this month, roughly 2 weeks from now. But compounding that is the fact that AMD is already 0-for-1 on launch availability predictions this week, after 250X failed to materialize at retailers as originally projected. AMD tells us that this was due to Chinese New Year, and that with the New Year vacations now at an end, production will pick back up in time for the 265 launch. This is a rational enough explanation, but we’re taking a wait & see approach all the same. But perhaps the biggest concern is whether retail pricing will actually match AMD’s MSRPs. In the last couple of weeks pricing and availability for 270 series cards has (in a word) taken a turn for the absurd, with supplies dropping and prices increasing. When Newegg has (as of this writing) 1 270 in stock for $250, and 270Xs starting at $280, it’s hard to imagine another Pitcairn card like 265 is going to be left unaffected at $149. Admittedly it’s not clear at this time why 270 series pricing is so outrageous – Cryptocoin Mania hasn’t previously influenced Pitcairn cards – but unless something changes to bring the other Pitcairn cards back down to their MSRPs, then $149 for 265 may be an unreasonable expectation. As for the 260, even though it already launched last month, availability and pricing are already sketchy. AMD’s board partners have been slow to take up the 260, and as a result the number of models on the market is very limited, amounting to just a handful in North America. The lack of selection has done no favors for the pricing, leading to 260 prices starting at $125. This is $15 above MSRP – a significant difference for this segment of the market – and just a stone’s throw away from the 260X at current prices. If the 260X price adjustment goes through as planned, then 260 needs to come down to its proper MSRP to have a place in the market. Finally, for the time being NVIDIA’s competition is going to be spread out, leaving a lack of direct competition for AMD’s latest arrivals. With the retirement of GTX 650 Ti Boost, NVIDIA doesn’t currently have a product directly opposite 265 at $149, with GTX 660 well above it and GTX 650 Ti well below it. On the other hand, NVIDIA’s closest competition for 260 as it stands is GTX 650 Ti, though this would shift if 260X cards quickly hit their new $119 MSRP. Frame pacing is an additional tool we run from time to time as is appropriate, but it's not something we'll use for every review. Frame pacing is largely influenced by drivers and hardware, neither of which shift much on a review-by-review basis. So it's primarily reserved for multi-GPU articles and new architectures as appropriate. And especially in the case of single-GPU setups, there's not much to look at. None of these cards has trouble delivering frames at a reasonably smooth pace. Yeah, that's what you guys said before the whole frame latency thing broke, too. It's a shame you aren't doing proper monitoring to catch it the first time and are setting up a scenario where it flies under the radar yet again the next time AMD decides to get lax on making drivers. It's a shame. I'm with your argument. AnandTech should try to include as many indicative benchmarks as possible. At times FCAT is indicative.